Frequent collaborator with José Alfredo Jiménez. Her career flourished in the 1950s and 1960s, recording the first of many dozens of albums in 1961. Battles with alcoholism interrupted her career for over a decade, but she returned in the 1990s to be discovered by new generations. Vargas made her debut at Carnegie Hall in 2003, and performed throughout the Latin world until her death in 2012. 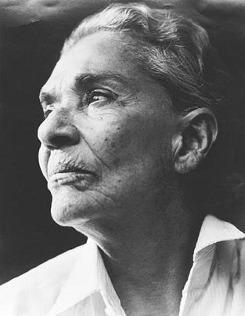 Told to El País in 2000 and quoted by Elisabeth Malkin, "Chavela Vargas, 93, Ranchera Performer", The New York Times, 6 August 2012: "Nobody taught me to be like this. I was born this way. Since I opened my eyes to the world, I have never slept with a man. Never. Just imagine what purity. I have nothing to be ashamed of." Frida (29-Aug-2002) · Death "La Pelona"